Providing you the best range of fire suit with effective & timely delivery. 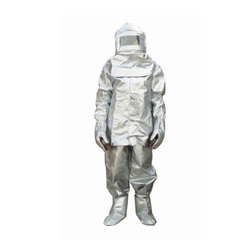 We are engaged in offering a wide array of Fire Suit which are designed keeping in mind the protection of the firefighters. These help in protecting firefighters from high temperatures at the time of fire mishap. An additional moisture/steam barrier lining provides protection in areas where exposure to hot liquids, steam, or hot vapor is a possibility. Redesigned for better fit, the Fire Suits are available in coverall or coat and pant styles.